Skeptic Setback? 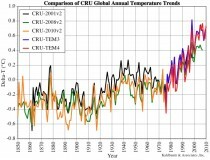 ;New’ CRU data says world has warmed since 1998 But not in a statistically significant way. Britain’s Climatic Research Unit (CRU), which for years maintained that 1998 was the hottest year, has published new data showing warmer years since, further undermining a sceptic view of stalled global warming. The findings could helpfully move the focus from whether the world is warming due to human activities - it almost certainly is - to more pressing research areas, especially about the scale and urgency of human impacts. 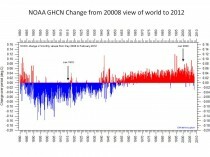 After adding new data, the CRU team working alongside Britain’s Met Office Hadley Centre said on Monday that the hottest two years in a 150-year data record were 2005 and 2010 - previously they had said the record was 1998. Data plotted by Kahlbaum/Wolff. This plot has saved versions (thanks to Craig Loehle) from 2001, 2008, downloaded versions from 2010, 20111 and the new HADCRUv4. Each iteration increases the trend by cooling the past and warming the present. Of course, this is just “business as usual” for the Phil Jones team. 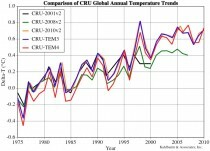 Here is a close-up on more recent years, see how much warmer CRU3 and CRU4 in 2011, 2012 are than CRU3 in 2010. 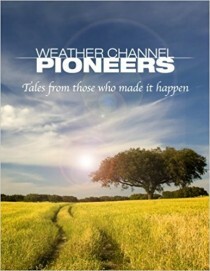 The 2011 and 2012 may be land only compilations. ironically they track well with the 2010 version until 1997 then diverge. More updates to follow. 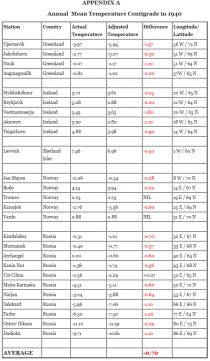 On the other side of the pond, here’s the NASA GISS 1980 data set compared with the 2010 version. More cooling of the past. In the private sector, doing what we see above would cost you your job, or at worst (if it were stock data monitored by the SEC) land you in jail for securities fraud. But hey, this is climate science. No worries. 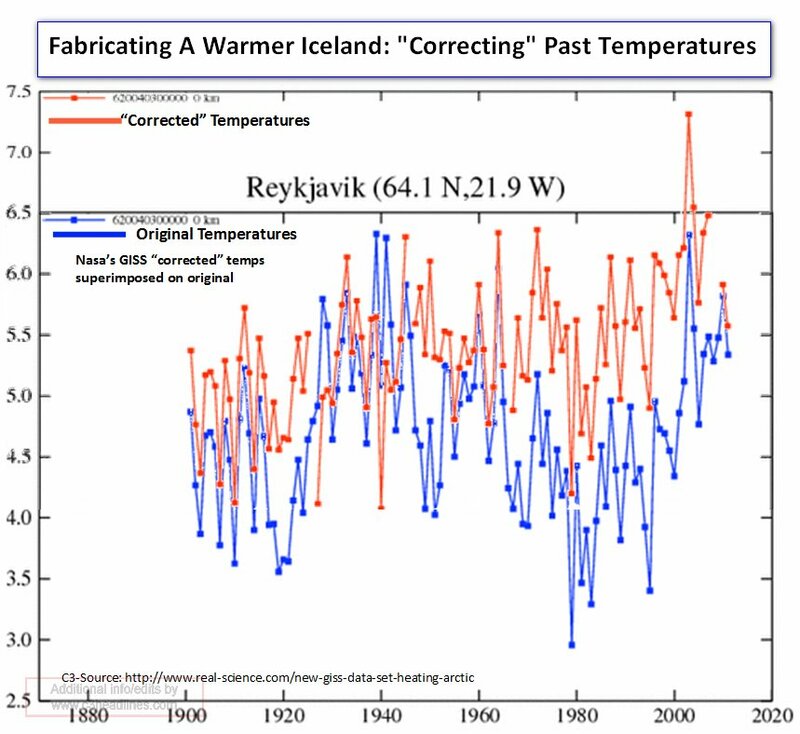 The result is a cooling of the past and a warming of recent data and thus an enhanced apparent warming trend. 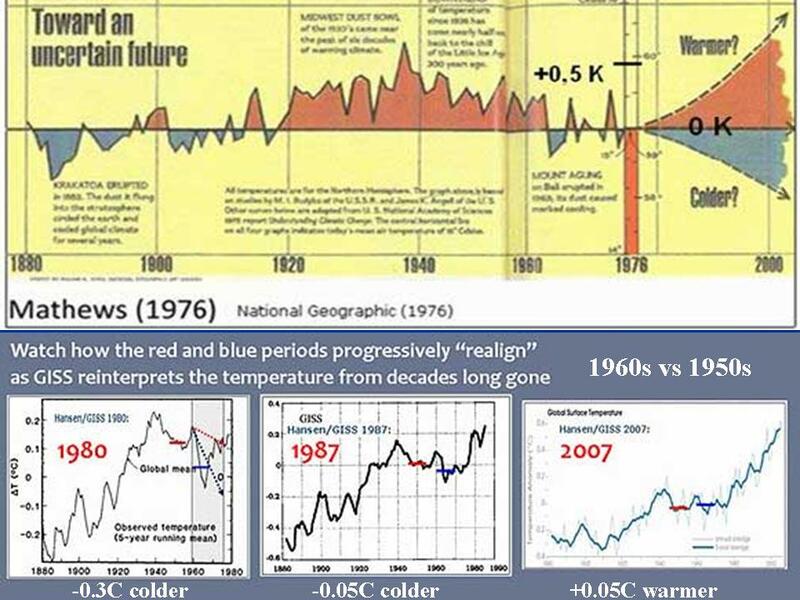 All up these adjustments increase the trend in the last century. 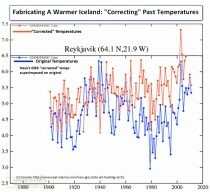 We have yet to witness a new dataset release where a cooling adjustment has been applied. The likelihood that all adjustments to data need to be positive is nil. This is partly why they argue so fervently against a UHI effect and other land use effects which would require a cooling adjustment. 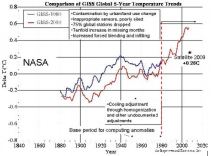 The two graphs from GISS, overlaid with a hue shift to delineate the “after adjustment” graph. 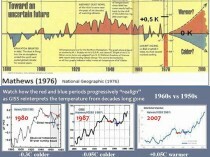 By cooling the past, the century scale trend of warming is increased - making it “worse than we thought”. CRU uses the same base data as GISS, all rooted in the GHCN, from NCDC managed by Dr. Thomas Peterson, who I have come to call “patient zero” when it comes to adjustments. His revisions of USHCN and GHCN make it into every global data set. Those who cool the past are condemned to repeat it.